THE CHIANTI REGION OF TUSCANY NEAR MONTESPERTOLI, ITALY—I am spending my vacation with 11 doctors, two nurses, three lawyers, and a retired judge. So long as the lawyers don’t sue the doctors (highly unlikely considering the fact that none of us are Italian Consigliere), it will be a great trip. Let me quickly correct something. I am not—repeat—not on a vacation. This is a business trip, as I am attending a medical conference (Note to the IRS: Really.) It is a conference with meetings and seminars and speeches and a big notebook full of long, incomprehensible articles with hundreds of footnotes. And yes, the meeting is a medical conference, but I’m a health care lawyers, for crying out loud, and they even asked me to be a speaker. I simply have to be here. The location is irrelevant. In fact, when I was invited to be a speaker at the conference, I didn’t even know it was going to be held in Tuscany. I thought it was going to be in Little Rock or Tunica. That’s my story and I’m sticking with it. The conference is being led by Dr. Jim Bailey, a brilliant physician with the University of Tennessee, who has recently published a novel about an idealistic young doctor who strives to discover what health care should really be about. Like the young doctor in Bailey’s novel, the participants of this conference have been addressing an ironic fact about America’s health: We have the greatest health care system in the world, and contrary to popular myth, we Americans have the greatest access to health care of any people on earth. But we are not a healthy nation. In fact, America is now in the midst of a virtual epidemic of obesity, hypertension, and heart disease. It seems that the more health care we get, the less healthy we become. Hence, the title of the conference, “The End of Healing.” The doctors, nurses, and yes, even the lawyers attending the conference are addressing how America’s health care providers can move from simply attempting to “heal” sick people to helping people be healthy. But the participants at this conference haven’t just talked about health. We’ve worked hard every day to be healthy! We’ve done it each day by eating healthy northern Italian food, drinking red wine (take two glasses and call me in the morning), and taking walks through the beautiful Tuscany countryside. We hiked up a mountain to see the home of Leonardo Da Vinci, arguably the Renaissance Man. He was a painter, sculpture, scientist and inventor. He left behind literally tens of thousands of pages of drawings of designs of inventions, including flying machines (planes as well as the modern day helicopter), bicycles, water systems, ginsu knives, the IPhone, and the Ron Popeil home barber kit. Well, OK, he may not have invented the last few items, but it wouldn’t surprise me if somewhere in his mountain top home in Tuscany one could find blueprints for those inventions. We also spent a memorable evening in Lucca at the Festival of Luminara di Santa Croce, witnessing the annual devotional candlelight procession through the streets of the old town center. It made the candle- light vigil at Graceland during Elvis Death Week look like a five year old’s birthday cake by comparison. Several years ago, there was a bestselling book entitled Why The French Don’t Get Fat. It attempted to explain the paradox of why the French dine on baguettes, cheese and pastries, wash them down with plenty of wine, and don’t get fat, while in contrast, we Americans starve ourselves on Weight Watcher dinners, go on crash diets, and keep putting on the pounds. There are two simple reasons. First, they eat very healthy food. 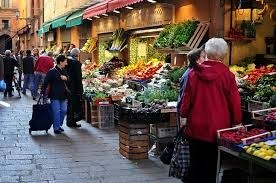 Second, they get that food by walking or riding their bicycles to and from the market, thereby burning off the calories of the wonderful food they eat. It all comes down to health, not health care. Next week I conclude my healthy vacation (or rather my healthy business trip) in Rome, and as they say, there’s no place like Rome. Until then, walk or ride your bicycle to the grocery, buy real food, and then walk or ride back home and enjoy. And follow Dr. Da Vinci’s advice: Take two glasses of chianti and call him in the morning! Rob Webb: Glad to hear your Tuscany experience was as rewarding for you as our was. Great food, comfortable lodgings, among like-minded companions; what else could one ask for? Your presentations were well received, and will be justifiable to the IRS, I might add.